The last few weeks have seen volatile grain markets as talks of Russia restricting exports, then not and back to restricting exports again has caused some swings and roundabouts in global futures and cash markets. 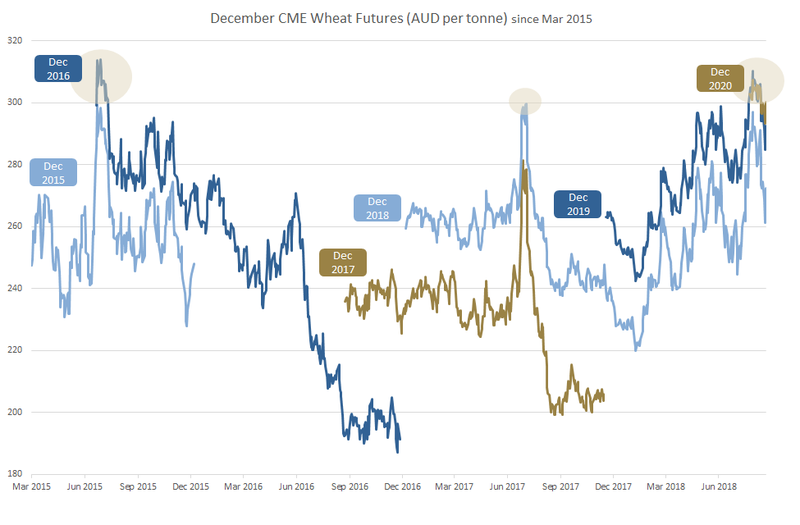 Domestically, there was some weakness in cash markets last week as the WA crop continues to get better and growers in the west chased markets lower, providing some liquidity to the broader market. Moving forward, one can expect the volatility to continue pending the discussions in Russia as SnD’s continue to evolve, domestically and globally. This year growers throughout the majority of NSW will be more so looking at buying grain rather than selling. Depending on your business, there are opportunities presenting in the market to look further out with your grain marketing or risk management. At the time of writing, 19/20 cash prices were advertised around $335 Port Kembla, which reflects a Chicago Dec 2019 futures value of $295 and local basis of around $40. Looking further out again, Chicago Dec 2020 futures are quoted at $302, with no basis bid at this point. You’re probably thinking, that is a far cry from $450 wheat currently with Chicago Dec 2018 futures at $276 and Basis of approximately $180. Historically anything with a 3 in front of it is generally a pretty good place to start. You also may be thinking, how will I know if I will have a crop next year, or the year after that? 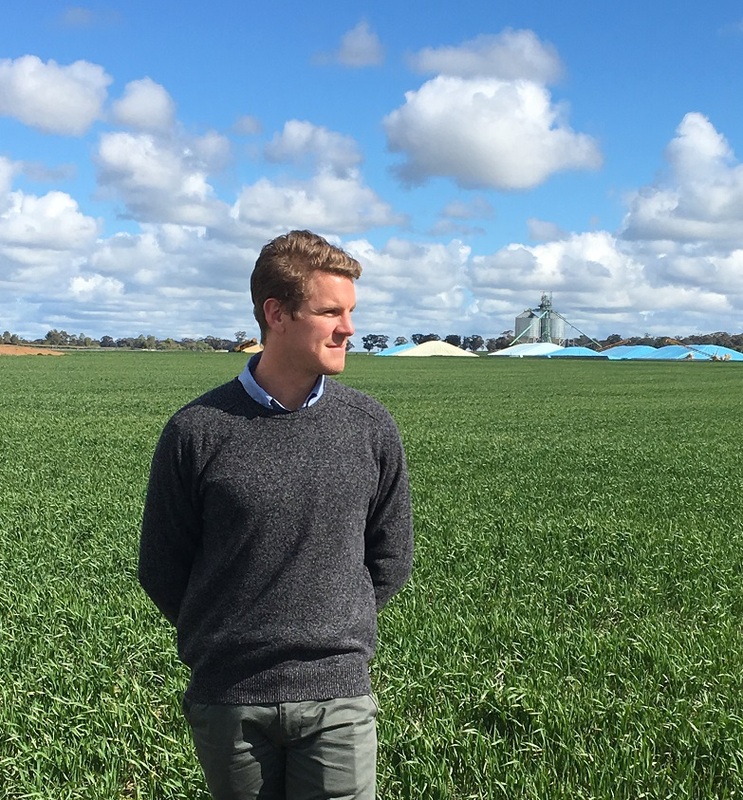 Starting to market your crop years in advance will not suit everyone or every farm business, however there are some handy opportunities for those who like to manage their price risk. To take advantage of 19/20 prices there are a few different ways you can tackle it, you could sell a multigrade, locking in both local basis and futures, you could look at a swap locking in futures only, or alternatively an AWB Basis Plus where you can independently fix futures or basis depending on your view of the market. In 2019, with basis already at $40 in NSW, which is about average over the past 5 years, a multigrade may be a suitable option for the more ‘hands off’ marketers. Looking further out to 2020, selling futures at $300 through either a swap or Basis Plus will give you the opportunity to lock in your domestic basis at some point over the next 2 years. In NSW, over the past 5 years, local basis has ranged between a low of -$15 in 2016 and high of $190 earlier this year. If you look back over the past 5 years, basis has averaged around the $20 to $40 range, so locking in $300 futures and having two years to lock in basis will be attractive to many. As with any forward selling, each business will need to assess if current values on offer make sense for them and whether is suits their individual risk appetite or risk management agenda. As we all know, over the medium term, high prices will kill high prices.